The rich tones of autumn have inspired your wedding reception decor. Lighten these dark colors with a special kiss of silver while still staying within your theme. The fall theme Hershey Kiss wedding favors are a wonderful mouthful of rich chocolate, sure to make anyone smile. 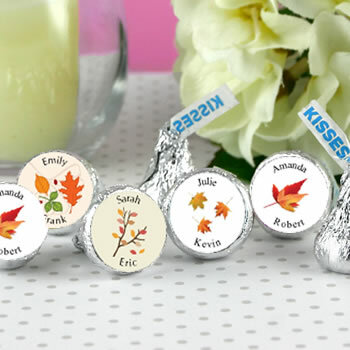 With four autumn inspired designs and your names printed on the bottom of each Kiss, these unique wedding favors will be a hit with your guests. Used to sprinkle on tables, to fill vases or baskets, or to include in gift bags, the fall themed Hershey Kiss wedding favors are a wonderful complement to your special day.